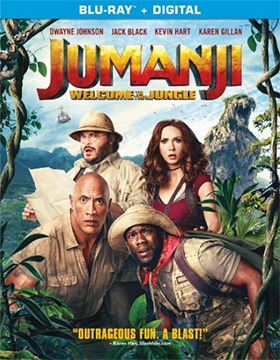 In something of a surprise move, Sony Pictures Home Entertainment has elected to move director Jake Kasdan’s smash comedy release of Jumanji: Welcome to the Jungle, starring Dwayne Johnson, Jack Black, Kevin Hart and Karen Gillan, to the home entertainment marketplace in a zippy 88 days by placing it on Mar. 20. With box office revenues of $352.6 million (and heading highter) holding back a couple of weeks for DVD, Blu-ray and 4K Ultra HD/Blu-ray Combo Pack product offerings wouldn’t have been the end of the world. Nevertheless, when you are in the stratosphere — in terms of box office receipts — Sony Pictures Home Entertainment can pick any date they damn well please for this blockbuster.